This is a guest post by Toby Sinclair, long-time Nat Hab India Expedition Leader and tiger expert. In 1998 Nat Hab Expedition Leader Suhail Gupta and I were in Ranthambore. We met up with the late Fateh Singh Rathore, the founding Warden and Field Director of Ranthambore Tiger Reserve. Ranthambore was one of the initial nine Tiger Reserves established in April 1973, and the first in a Dry Zone Forest habitat. 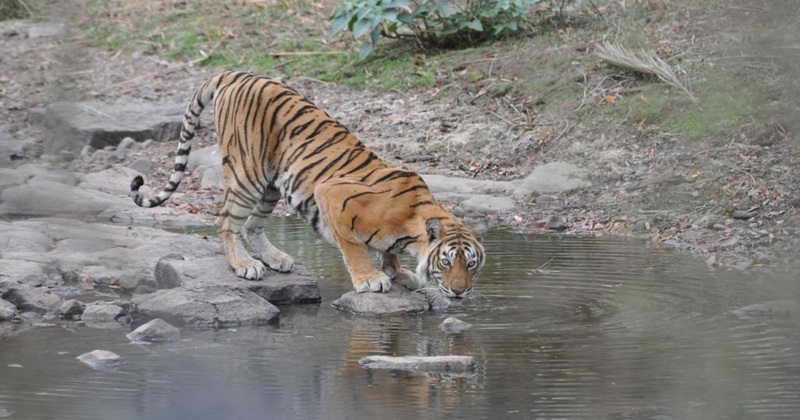 We first saw Machli as a young tigress as she separated away from her mother and siblings. We were on the bund (embankment) above Malik Talao, the northernmost of the three lakes in the center of Ranthambore. In 1999 the BBC started filming in Ranthambore, and it was soon obvious that Machli was the tigress to watch. She quickly took over her mother’s territory and established herself in the core of this great park. The BBC program was released in 2000 as The Tigers’ Fortress. This was quickly followed by another BBC Natural World program called Danger in Tiger Paradise. In 2002 we made a program with Saba Douglas-Hamilton and Valmik Thapar for BBC titled In Search of Tigers. All were produced by Mike Birkhead, with whom Suhail and I had worked with on the six-part series Land of the Tiger (BBC/PBS 1997), and filmed by Colin Stafford-Johnson. These were all shown on Discovery and Animal Planet in the US. Over the next few years, Colin followed Machli for two films with Japan’s NHK that I also handled permits for. And he made a prize-winning film called Broken Tail that explored the fate of one of Machli’s cubs. Many other teams followed Machli and spread her image across the world. The BBC made two other films using some of our earlier footage, and in 2012 Colin returned with Mike Birkhead and made Queen of Tigers for BBC. This was an affectionate review of Machli’s life, and Colin’s farewell to a friend. In all these films we were privileged to handle all the planning, permissions and logistical support, something &Beyond South Asia specializes in. In total, we assisted in more than 500 days of filming, much of which was focused on the remarkable tigress who died this week at age 19. A great, and possibly unique, age for a wild tigress. Machli’s legacy will live on among the new generations of tigers in the park. She had four litters and all have produced subsequent generations of cubs. Since 2013 we have been taking Nat Hab clients to Ranthambore on our India tiger photography tours that we operate between April and June, and many of our travelers were privileged to see this great cat. This past summer, every client saw Machli’s daughter and the next generation of cubs.